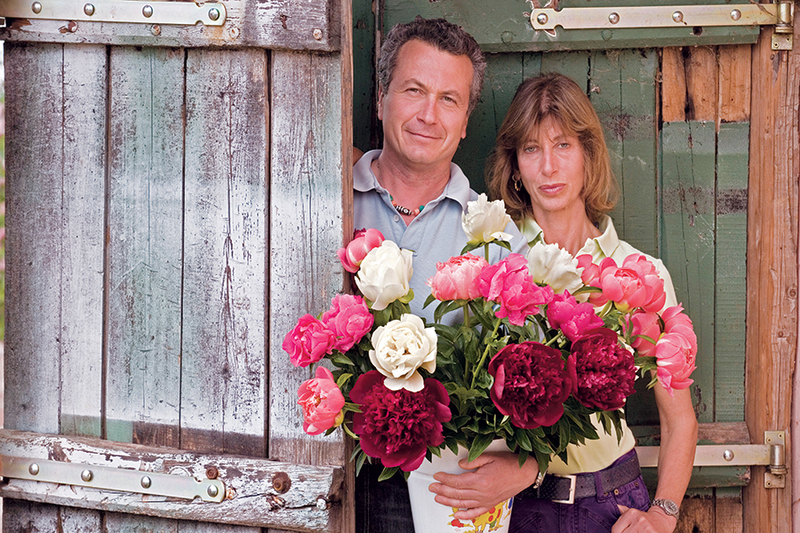 Peonies bloom only once a year for a rather short time. Their spectacular flowers are delicate, so much that sometimes a violent thunderstorm is enough to ruin them irreparably. However, they are exceptionally charming flowers, and their explosive blooms are one of the most exciting sights of spring. Moreover, considering the beautiful appearance of their leaves, the limited maintenance they require and their long lifespan (a Chinese saying claims that if you plant a peony you plant it for you, your children and your children’s children), it is easy to understand why it is so easy to fall in love with these plants. Just by following a few basic principles they will be our faithful and generous companions for very many years. Peonies are perennial plants, either herbaceous or trees, belonging to the Paeoniaceae family, which is very close to the Ranunculaceae family, to which in fact they originally belonged. Peonies are present in nature only in the Northern Hemisphere, in the area between the 25th and 67th North Parallels; they are often found in mountainous or hilly areas and they prefer well-drained soil, from sub-acidic to slightly alkaline, and exposure to abundant sunlight; they can stand cold weather and drought. The main feature of herbaceous peonies, which are found in nature in North America, Europe, Northern Africa and Asia, is that their aerial part dies during the winter; the new stems start directly from the root collar, also called “crown” a few centimeters underground. The fleshy roots act as a reservoir for the substances allowing the plant to survive the cold season unharmed; herbaceous peonies then develop several stems every year carrying the leaves, and on top, the floral buds. Like all perennial herbaceous plants, tufts of herbaceous peonies grow horizontally but keep the same height over the years. Tree peonies, which are found in nature only in the mountainous regions of eastern China, show a different type of growth: they produce true wooden branches on which the buds carrying leaves and flowers sprout in spring. Tree peonies, that are not really trees but shrubs, tend to grow both horizontally and vertically, like all shrubs, and sometimes grow to be larger than 2 meters in both height and diameter. 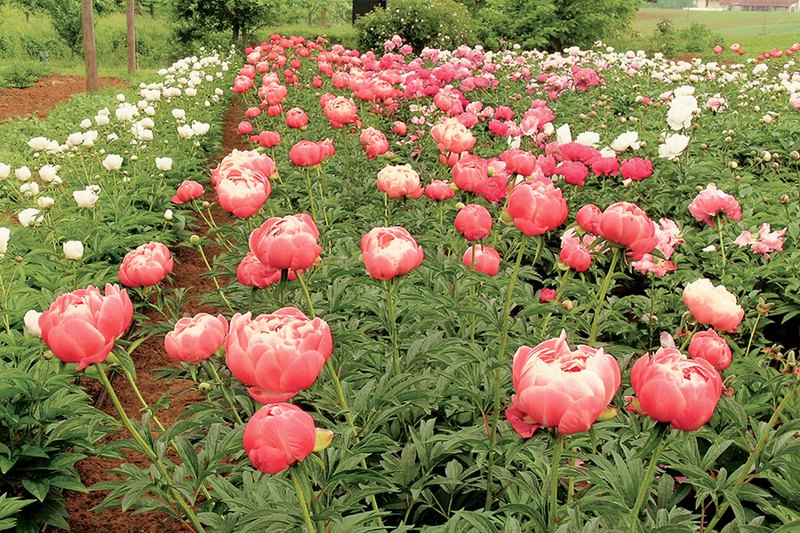 Altogether there are a few thousand varieties of peonies, including both trees and herbaceous, with an amazing variety of colors of the flowers. The flowers can be classified in at least five different shapes, and by growing different varieties the blooming period can be extended to more than two months. This is the result of about thirty centuries of selection, first in China and Japan, then in Europe and finally in North America. In the Far East, especially in China, the tree or “Moutan” peony is considered “king of the flowers” and is the object of a true cult; a plant already known officially 1000 years before Christ, it was placed under the emperor’s protection around the year 600 AD. The emperor would generously pay for the best varieties, thus stimulating generations of hybrid breeders to cross-fertilize and select the plants. Chinese varieties are usually characterized by a double, very large flower, with the stamina often completely transformed into petals; sometimes the flowers are so heavy they appear to be falling. After being brought to Japan (probably by Buddhist monks) tree peonies were further selected; the local beauty criteria led to the creation of plants with lighter flowers, well exposed above the vegetation, simple or semi-double in which the yellow stamina stand out on brightly colored petals. In Europe, peonies are found in nature in several varieties, all herbaceous, known in ancient times especially for their healing virtues. Herbaceous peonies are often depicted in religious paintings dedicated to the Virgin Mary, and are grown as ornamental plants in parks and gardens. 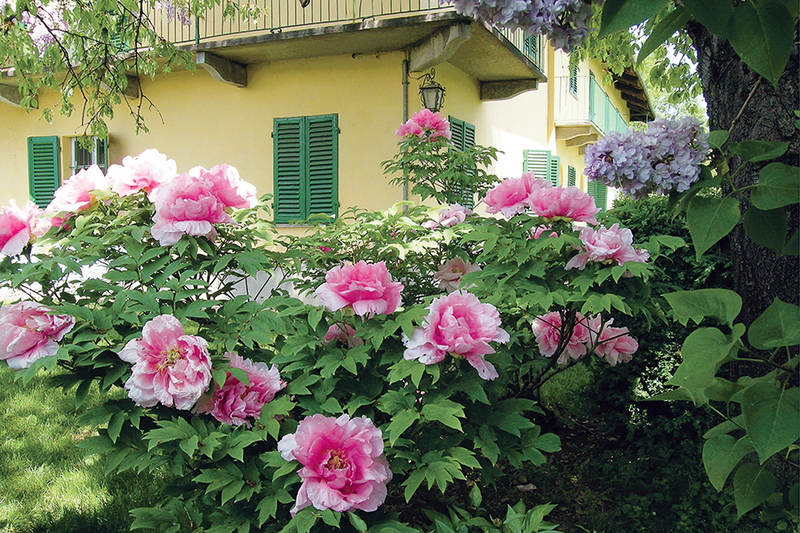 The few European varieties known before the year 1800 descend from Paeonia officinalis: many of them were obtained in France. Also in France, after the travels of explorers and “plant hunters” in the nineteenth century, the cultivation and selection began of herbaceous and tree peonies from the Far East, previously unknown on our continent. During the second half of the nineteenth century, scores of new varieties were created and spread thanks to the work of hybrid breeders such as Calot, Lemoine, Crousse and Dessert: many of these are still cultivated and appreciated. 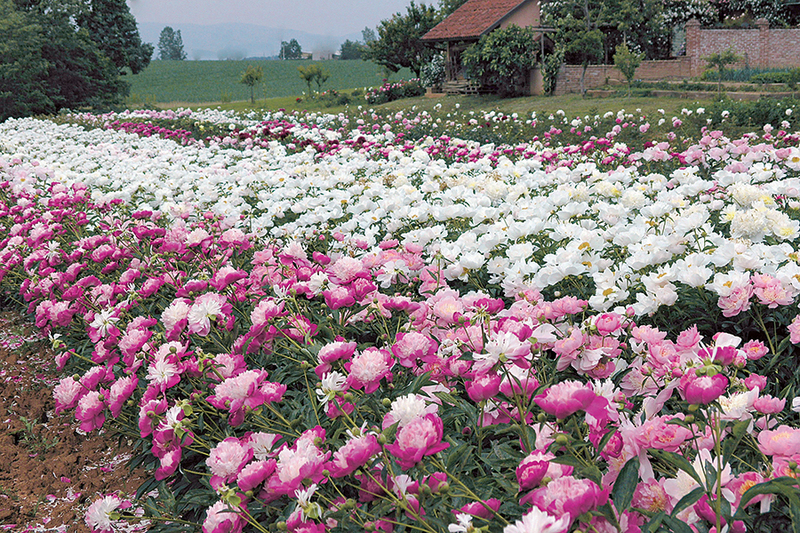 In the first years of the twentieth century, peonies also belonging to different species were cross-fertilized, thus obtaining the first herbaceous and tree hybrids. In France, the first yellow tree peonies with huge double flowers were created, thanks mostly to Louis Henry, Maxim Cornù and Pierre Lemoine: these are hybrids of Paeonia suffruticosa, cultivated for centuries in China and Japan, and Paeonia lutea, a yellow-flower species described for the first time and brought to Europe from China by Abbé Delavay at the end of the nineteenth century, together with one which will be named Paeonia delavayi. The first “Lutea hybrids” obtained by the French, had a weak floral stem, however, and the flower was so heavy and prone to bending towards the ground that it had to be supported to fully appreciate its decorative effect. 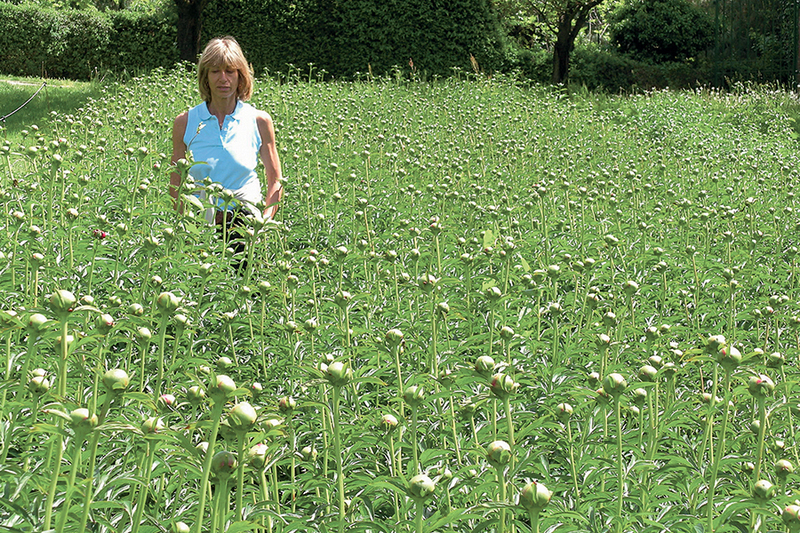 In the fifties Prof. Saunders, an American already known as a hybrid breeder of herbaceous peonies, solved the problem through a series of carefully planned cross-fertilizations aimed at increasing the strength of the stem and the vegetative vigor of the plant. He thus produced a whole series of hybrids with simple, semi-double and double flowers, of great decorative effect. Other American enthusiasts followed in Saunders’ footsteps: among them we must mention William Gratwick, and it was especially Nassos Daphnis, with his back-crosses, who opened new hybridization paths. Daphnis created some of the most unusual and wonderful Lutea hybrids available today. The latest step in the history of peony hybridization was taken in the seventies by Toichi Itoh from Japan, who managed to crossbreed a herbaceous species, Paeonia lactiflora, with a Lutea hybrid, that is a tree peony. The plant thus obtained shows characteristics that are intermediate between the two parents: the aerial part dries up in autumn like with herbaceous peonies, but the branched stems, the leaves and flowers are similar to tree peonies. These new crossbreeds, called “intersectional hybrids” or “Itoh hybrids” are still rather rare, but their beauty and rustic character predict great success. Starts rather early with the herbaceous botanic species and the hybrids derived from them, and continues according to the pattern depicted below, with the tree varieties belonging to the Moutan group (Chinese, Japanese and French tree peonies) and then with the Lutea hybrids, also belonging to the tree group. P. lactiflorawith a simple and double flower. 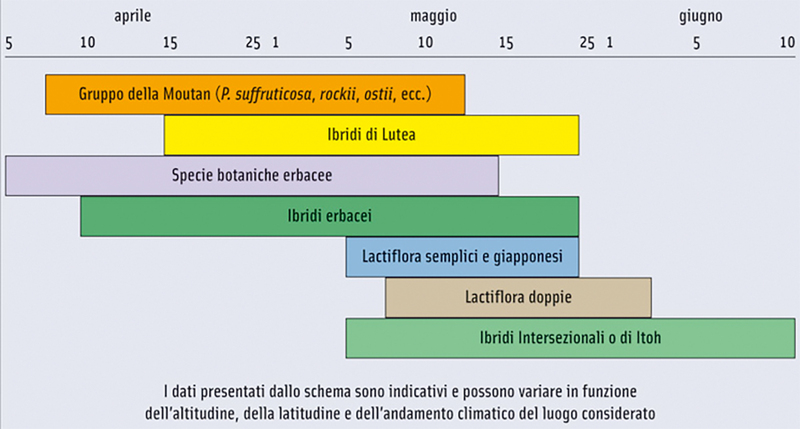 Describing varieties, we used adjectives: very early blooming (molto precoce), early blooming (precoce), medium-early blooming (medio precoce), mid season blooming (fioritura a metà stagione), medium-late blooming (medio tardiva), late blooming (tardiva), very late blooming (molto tardiva); this description must be understood in any group, the herbaceous group and the tree peony group. 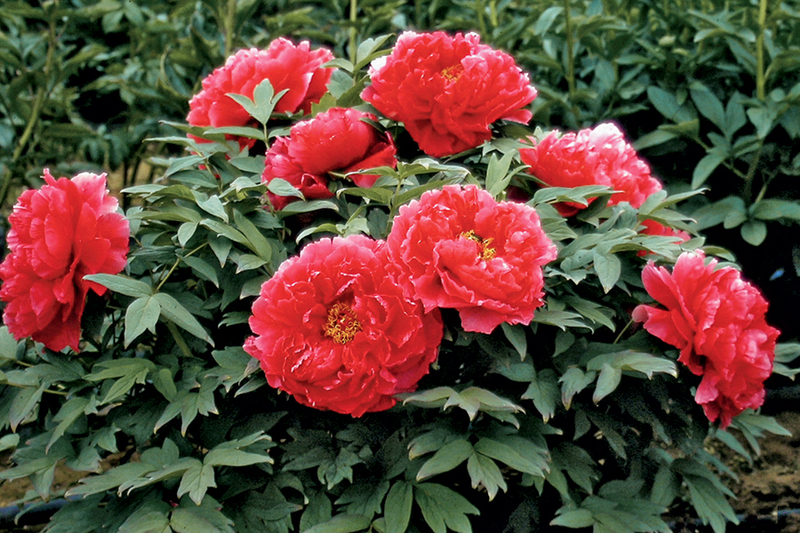 For example a late blooming tree peony can bloom in the main time of a medium late herbaceous variety. The flowers of this kind have a single turn of petals encircling the pollen-carrying stamina and the carpels in which the seeds will develop. in this type of flower two or more turns of petals can be found, but both stamina and carpels are always evident. in these flowers the stamina are partially transformed into petals, and the structure of the flower is the same as the simple flower, with clearly identified petals. Usually flowers in which the stamina are flattened but only partially transformed into petals are referred to as Japanese, while when the stamina are completely transformed they are called petaloids and the flowers are called anemone-like. double flowers have all or almost all of their stamina and carpels transformed into true petals.